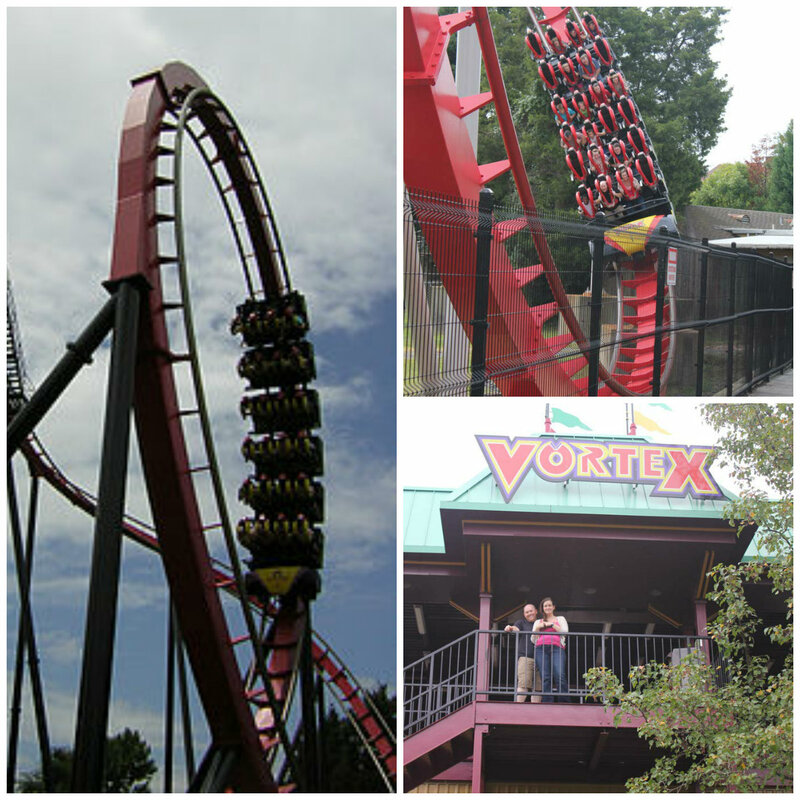 Constant loops, spins, drops, forward, backward, and corkscrew turns brought my senses alive with excitement at Carowinds in North Carolina. Each roller coaster offered breathtaking views, heart pumping adventures, and unique thrills. Highlights of the day: Drop Tower, Intimidator, Vortex, and Carolina Cobra. Strapped into an open car and lifted 160 feet into the air at a speed of 16 feet per second, we felt the tension build as we were held for a few seconds, and then dropped on a 100-foot, 56 mph freefall. Just 60 feet above the ground, the ride’s magnetic braking system saved us from gravity and gently brought us back to reality. The Intimidator is the tallest, fastest, and longest coaster in the Southeast! It dominates the skyline at 232-feet tall and sends you plummeting down a 211-foot first drop, then races through more than a mile of high speed twists and turns, including seven extreme drops in excess of 75 MPH! The initial climb is enough to make anyone’s hair stand up and when you come over the top of the curve in the back of the roller coaster, you’re at top speed and guaranteed to let out a yelp. The most nerve-racking part of the ride: you’re only strapped in around the waist. As we flew over the top of each peak, I was lifted completely off of the seat and suspended in mid air before dropping into another loop of extreme fun. This stand-up rollercoaster took us on a 50-m.p.h. 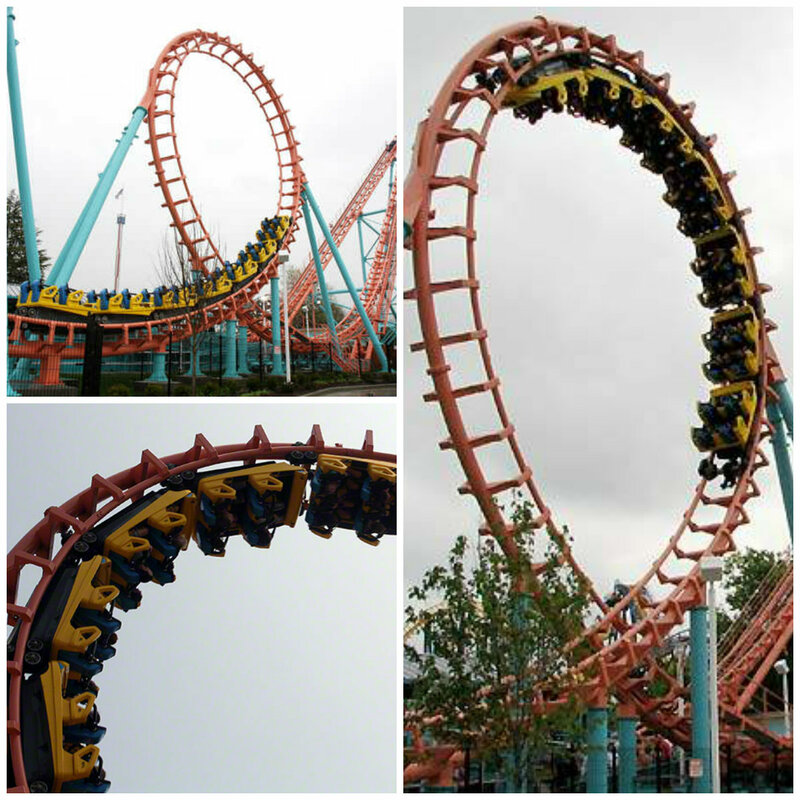 series of fun-filled loops and dramatic drops. With an upward helix, followed by a right corkscrew, another upward helix, and a wide turnaround, our heads were nodding with approval after the Vortex. 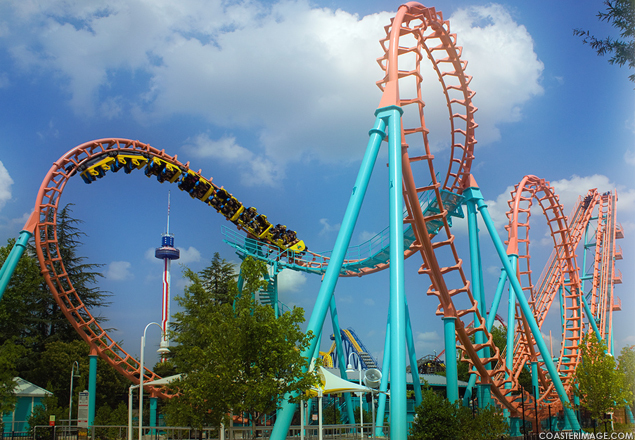 Carolina Cobra features three inversions, including a cobra roll and loop; Back and forth for a total of six inversions. Starting out backwards, we were pulled to the top of the ride and let go! The initial, forward motion was exciting, but the backwards return really got my blood pumping. Amusement parks are typically known as great places for children, but even the extreme adventure seeker, like myself, can find excitement around every corner at Carowinds! I just might need a season pass for next year. This entry was posted in Adventure, Land Adventure, North Carolina, Travel, USA and tagged Adrenaline, adventure, amusement park, bucket list, Bucket List Publications, Carowinds, Carowinds Amusement park, Lesley Carter, North Carolina, rides, roller coaster, travel, Travel blog, travel magazine, USA by lesleycarter. Bookmark the permalink. Do you have a favorite amusement park? I love adventures, but boy do rollercoasters just not do it for me. I think it’s because my very first rollercoaster traumatized me. Love the pics and descriptions! Carrowinds is one of the amusement parks my Dearly Beloved and I plan to visit in coming years. We were thrown a bit behind schedule in getting to new parks by our marrying, although the honeymoon gave us the chance to take in De Efteling in the Netherlands and Blackpool Pleasure Beach. I used to go to Six Flags Magic Mountain at least once a year… but it has probably been 8 years since I made it over to the park at this point. Your photos and commentary made me long for those thrills again. I just might have to make some time for that in the near future. As always, thanks for sharing your adventures with us. Can’t do the roller coaster thing, but my oldest son loves them. He would love a trip to Carrowinds. Thanks for another great idea! Love rollercoasters! Hey, Lesley – wait until they have the Felix Baumgartner Ultimate Skydive plunge for you to experience! Wow, all of the rides look so scary. Glad that you had fun. My first thought was make sure you have a empty stomach before riding! Gosh, I miss those thrilling roller coasters! Love it lots! Yes yes yes! I want to go here! TODAY! Fun , Fun and more fun – love it!!! Those look awesome! I like rollercoasters and speedy rides, but I really hate those that just spin you around and around in a circle… like those octopus rides. They just make you smack your head to one side and give you a headache, without any real thrill or sensation of speed. When I was a little girl, we used to go to this park with my summer camp. I remember jumping across the border over and over. It is a very fun park!! Thanks for the memories!!! Love the new look of your site! One of my best friends used to work at Carowinds in college. You know my fave roller coaster, thought? The one at Dollywood in Tennessee! Seriously. So fun. Our kids loved Carowinds. My son had a birthday party there once and he and his buds got fake dragon tattoos. Wonderful memories! I miss the excitement of the rides. I used to love them and the more extreme the better but with congestive heart failure they really don’t reccomend you do anything that might make your blood pressure drop suddenly. It is time to take vacation! The brave thing to do would be to ride that after a couple of chili dogs…. I love Carowinds and the intimidator and I have many rides together. The water park is pretty good in the summer as well. 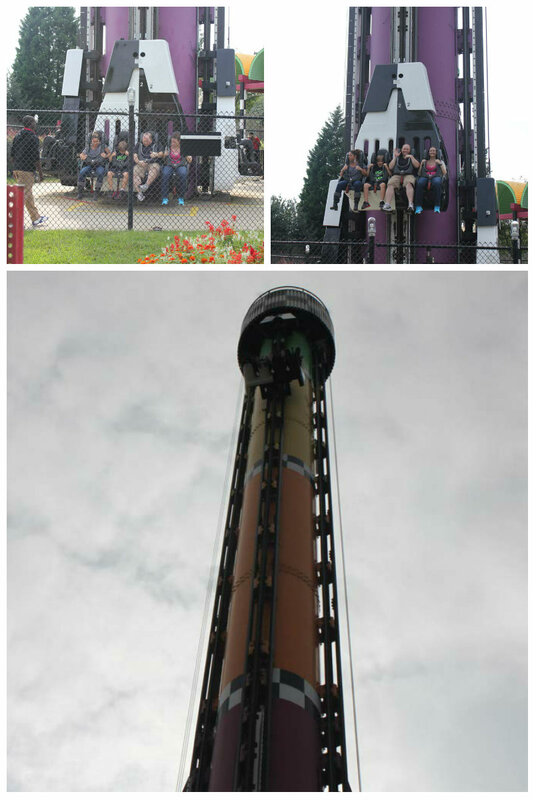 Great memories…..
We live 14 miles from Kings Island amusement park in Ohio and my 3 kids go every week! Thirteen roller coasters……..bring it on. Oh, and they all happen to have Down syndrome. Amazing..your descriptions make it seem like I’m riding the things with you! I just went to Carowinds a couple of weeks ago. It’s so much fun! Glad someone else recognizes what a gem of an amusement park the Carolina’s have! Glad you had fun! However nobody will ever get me to go on a roller coaster ever. I was traumatized at the age of 4 by the “kiddie coaster” at the local amusement park in my town (appropriately named Playland). I tried to give them another go when I went to Six Flags in NJ in middle school and went on another kiddie themed roller coaster to see if I could stomach the big scary ones. I was terrified the entire time and knew for certain I could never get past the 4 year old terror haha. To each his/her own, right? I’m sure there are some things that you really enjoy or don’t fear at all that would make me shiver with fear. I hate spiders and no matter how rational I try to be about it, I can’t get over it. You know, the concept of an ammusement park makes sense, but I am afraid of heights and cannot do rollercoasters. However, ammusement park food is yummy. YIKES! Wish I could still do these, but….yikes! There is nothing like a good roller coaster ride to clear the senses! Great post! Have you been to Cedar Point and Kings Island? I’ve been to Cedar Point, but where is Kings Island? If only my heart can take the effect of the plunge. Those rides seem really exciting. 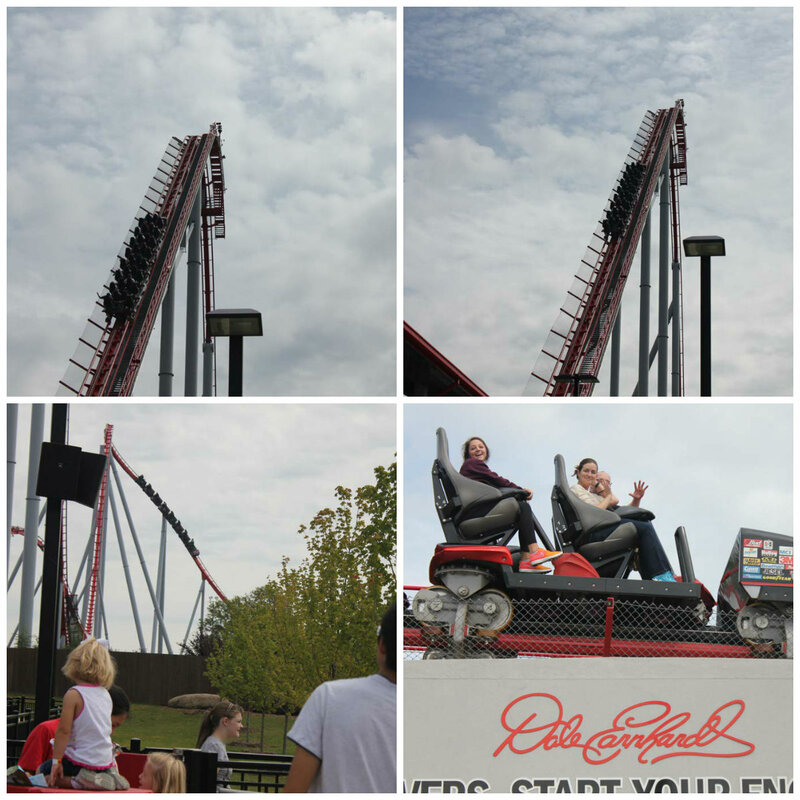 I rode the Intimidator for the first time this past weekend at Carowinds (or Scarowinds during Halloween season)! It was awesome! Is going down that first hill similar to what it feels like to jump out of an airplane? Now you’ve just made me sooooooo damn jealous! I love theme parks and particularly roller coasters and it’s the one BIG thing I really miss from my new life in Cyprus. Since leaving the UK to live here permanently in 2004 I haven’t been on even a funfair ride…..
It’s a very sad state of affairs and I’m getting the urge to travel and find one soon!!! When I lived in Charlotte I would purchase season passes for myself and my son. We would spend countless afternoons there enjoying the coasters and cooling off in the water park. My son’s first coaster ever was Carowinds’ The Hurler. Good times! Sounds like a ton of fun! Except the falling part…hahaha. I’m actually a little surprised that roller-coasters are even exciting to someone like you who’s experienced so much!